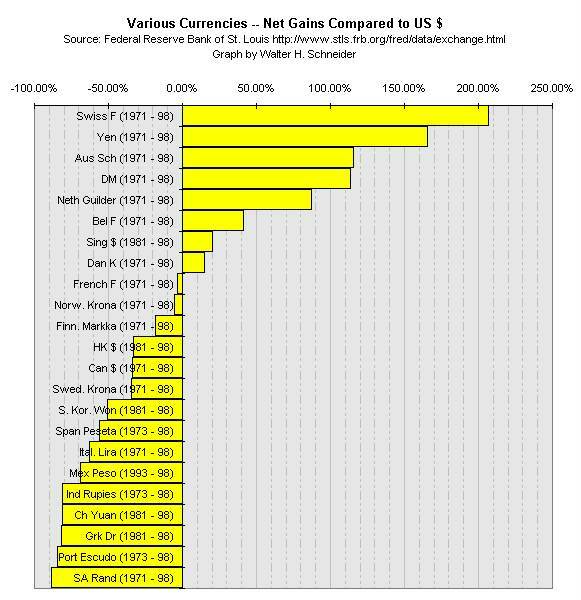 It appears that the state of the American economy has an large influence on many currencies, but it is also quite obvious that the policies of the various presidents had detrimental as well as beneficial impact on the value of the American Dollar. Under Richard M. Nixon (1969-1974) the US Dollar steadily fell. During the terms of Gerald R. Ford (1974-1977) and Jimmy Carter (1977-1981) the decline of the American Dollar continued. 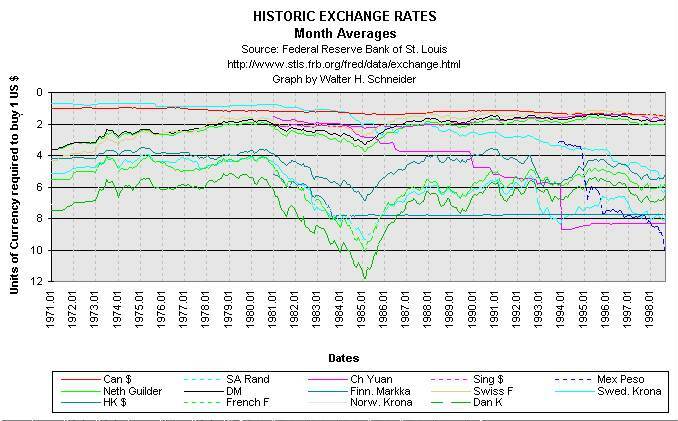 When Ronald W. Reagan (1981-1989) came into power, the American Dollar rose sharply in value against all major currencies (with the exception of the Japanese Yen -- not shown in the chart) and continued to increase until early in 1985. After that the value of the US Dollar dropped sharply over a period extending to December 1988. During the term of George Bush (1989-1993) the US Dollar began a roller-coaster ride, with a general deterioration in value extending into early 1995, the second year of the term of William J. Clinton. Under William J. Clinton (1993-Present), from early 1995 on until now, there was no perceptible gain in the value of the US Dollar when compared to all other major currencies, including the Yen. The gains in the latter part of Bill Clinton's term equal the losses in the beginning of his term. The following graph shows the relative gains by the major currencies as compared to the American Dollar over the period from January 1971 until September 1998. The information in the two graphs above was compiled from historical foreign exchange rate information available at the Federal Reserve Bank of St. Louis.